This book is a wonderful read to those willing to sit through a terrible story of 3 amazing orphans on their terrible journey of ups but mostly downs. 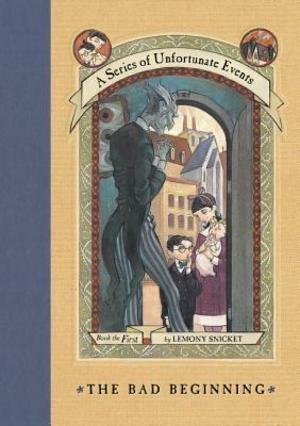 Lemony snicket truly captures the feelings of these sad events and what transpires when one has a truly terrible 'close relative'. Count Olaf is certainly one being that I wish no close encounter with, ever. Just as good as I remembered it! A modern day Classic in which a YA writer uses interesting and unusual writing techniques to entertain as well as to get his point across. It makes me want to read every single book in the series all over again. Educationally, I would want to use this as a writer's study because of his unique writing style. It also has good vocabulary words that are useful to know and can be used for vocabulary quizzes.